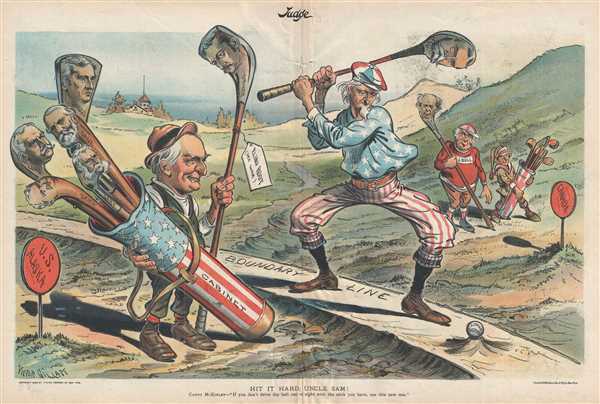 A golf themed political cartoon mocking the continuing Alaska boundary dispute between the United States and Canada. Hit It Hard, Uncle Sam! This is a golf-themed Victor Gillam political cartoon from the August 19,1899 issue of Judge magazine most likely mocking the government's inability to reach an acceptable resolution to the Alaska boundary dispute between Canada and the United States. Gillam's cartoon illustrates Uncle Sam playing a round of golf with John Bull, his British counterpart. President McKinley is acting as Uncle Sam's caddy, carrying a star-spangled golf bag that reads 'Cabinet' and is filled with clubs bearing caricatures of different cabinet secretaries. Bull's caddy is Canada, and they watch while Uncle Sam prepares to hit a golf ball labeled 'Alaskan Dispute' with a club labeled Hay, a reference to John Hay, McKinley's Secretary of State. Hay was a very successful politician and diplomat, serving in various government capacities from Lincoln's administration until his death while serving as President Theodore Roosevelt's Secretary of State. The caption, stated by McKinley, reads, 'If you don't drive the ball out of sight with the stick you have (Hay), use this new one (labeled as the driver and bearing the likeness of Elihu Root, then the Secretary of War). The southern boundary of Alaska, even during era of Russian rule when Alaska was known as Russian America, had never been concretely defined. Russia and Britain signed a treaty in 1825 defining the borders of the respective possessions, but the definitions were vague at best. When the United States bought Alaska in 1867, the boundary was still ambiguous at best. There was a movement in the United States that was pushing for annexation of British Columbia, which would give the U.S. geographic dominance over the Pacific coast of North America north of Tijuana. This did not come to pass, however, since British Columbia joined the new Canadian Confederation in 1871. At this time the Canadian government requested a survey of the boundary between British Columbia and Alaska, but the U.S. dismissed the idea, stating that it was too costly, and added that the are was remote, sparsely populated, and without any economic or strategic interest. This status quo changed in 1898, when gold was discovered in the Yukon, and everything changed. With the discovery of gold in the Yukon, Canada wanted to establish an all-Canadian route from the gold fields to a seaport. American, however, did not agree, and, it is claimed, harassed any Canadian that tried to stake a land claim to help sway any future decision with regard to setting the border. Tens of thousands of American moved into the region, and with over 100,000 fortune seekers streaming through Alaska into the Yukon and Klondike gold fields. This influx greatly disturbed the Canadian government, which dispatched a detachment of North-West Mounted Police to the area to secure the border. The massive influx of people, however, quickly proved too much for the Canadian police, who were forced to retreat. They took up new fortified positions in two key mountain passes, complete with Gatling guns, in order to enforce the Canadian point of view. American officials, however, believed that the Canadian police had set up their roadblocks at least twelve miles inside American territory. This misunderstanding led to the establishment of the Joint High Commission of 1898-99 which was given the task of diffusing the situation and establishing a concrete border. After months of discussions, the Committee sent a treaty to the Senate, which was promptly rejected, because western states did not like it. The border dispute would continue for another four years, until the Hay-Herbert Treaty was signed and ratified in 1903. This political cartoon was drawn by Victor Gillam and published in the August 19, 1899 issue of Judge magazine. Frederick Victor Gillam (c. 1858 - January 29, 1920) was an American political cartoonist, best known for his work in Judge magazine. His work was also published in The St. Louis Dispatch, Denver Times, New York World and New York Globe. He was born in Yorkshire, England and his family immigrated to the United States when Gillam was six year old. His older brother Bernhard Gillam (1856 - 1896) was a famous cartoonist as well, leading Gillam to sign his work 'Victor' or F. Victor' until his brother's death. He was also a member of the New York Press Club and New York Lotos Club. Gillam died in Brooklyn, New York on January 29, 1920. Gillam, V. 'Hit It Hard, Uncle Sam!.' Judge Vo. 37 No. 93D, August 19, 1899 (New York: Judge Publishing Company). Judge (1881 - 1947) was a weekly satirical magazine published in the United States. The first issue was first printed on October 29, 1881 and was only sixteen pages long. Judge was launched by James Albert Wales, Frank Tousey, and George H. Jessop, who had previously worked for its rival magazine Puck. In the mid-1880s, William J. Arkell purchased the magazine, which was having difficulty competing with Puck. Arkell, taking advantage of his considerable wealth, persuaded cartoonists Eugene Zimmermann and Bernhard Gillam to leave Puck and join the staff at Judge. As Arkell was a supporter of the Republican Party, Judge soon became a platform for criticizing the Democratic administration of Grover Cleveland, which was blamed for the Panic of 1893, among other issues. With support from the Republican Party, Judge saw a rise in popularity during the 1880s and 90s, surpassing Puck in both content and circulation. Judge also widely supported the candidacy of William McKinley, largely through the work of cartoonists Victor Gillam and Grant E. Hamilton. Judge reached its peak circulation of around 100,000 by 1912. One of its former editors, Harold Ross, used his experience at the magazine to launch his own publication, The New Yorker in 1925, which quickly began to compete with Judge. Due to the success of The New Yorker and the Great Depression, Judge became a monthly is 1932 and ceased circulation in 1947. Very good. Even overall toning. Wear and creasing along original centerfold. Slight loss along original centerfold. Text and cartoons on verso.